This Paint kit is suitable for non metallic paint on bumper bars & other plastic parts and panels. Do not use this kit on the car body as most car bodies are made from steel. 1) Restore plastic primer to panels & parts to promote adhesion between the plastic & the paint ensuring permanent repairs. 2) Restore non metallic color that has been removed using original factory O.E.M exact match paint color. 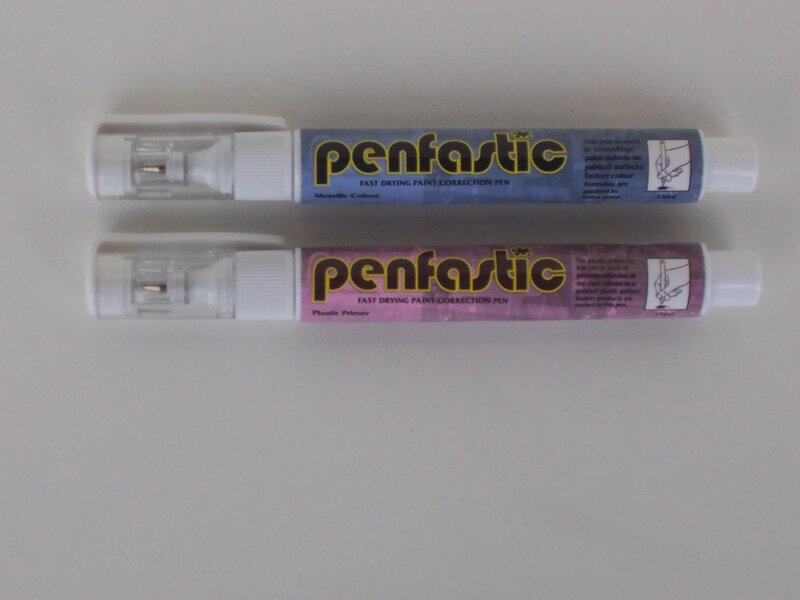 Definition:Plastic primer pen is used to promote adhesion between the plastic surface & applied top coat paints where the paints have been completely scratched by impact of foreign object. Failing to apply the plastic primer before painting will lead to a failed long term touch-up repair. Definition Use: Brush Touch Paint color product is used to cover deep discolored scratches, chips & paint defects caused by impact of an object where color coats are completely removed and/or left paint transfer that is impervious to solvent & is to thick to remove using cream cutting agents. If sanding is required then Aerosol spray should be used. Procedure: Shake color contents well. Remove cap and squeegee brush. Check the color is correct. Apply 1 to 2 coats of color Brush Touch only to the fully discolored areas of damaged paint where the paint layers including the color coat has been completely removed. Allow 3 minutes drying time in between coats in good weather. If you have impact residue that did not come off in earlier steps, apply one or two coats of color directly on only the discolored areas. Paint Color Tips & Tricks: Always know your paint layers and make sure your not touching up scratches with the incorrect paint product or the scratch will look just as bad as the original scratch. You can usually tell which layer the scratch is in when using the Solvent or Clean-up solution. As the solvent is applied it will give the area a wet look. While it is wet if the scratch disappears that usually means that your paint scratch is confined to the top coat layer of the paint color and Clear Gloss should be used.